Both fun and playful, Stavanger’s poems display wit and beguiling originality. They shift from the oddball to the vulnerable and from the zany to the deeply meditative. Stavanger’s collection embodies a spirit of the post post modern in both intellect and spark, while playing off cool disjunctions against electrifying erudition. 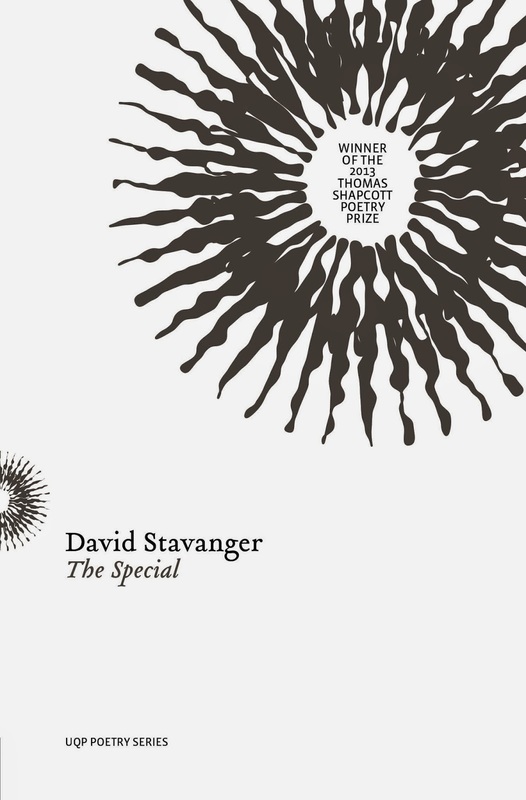 There is a strong trace of the performative and dramatic in these poems, Stavanger’s flair for performance poetry gives this award winning collection a distinct and likeable flavour. The Special isn't my usual read, but a series a witty, intelligent and poignant stages of life told in the form of a series of poems. David Stavanger shares his first hand account of mental illness, first love, forever love, heartbreak and the dark and light in between. Rather than a traditional review, I'd love to share a few of my favourite lines, as poetry is a very personal journey and translated differently by each reader. You were taller when we met, I was smaller when you left. After the break. Page 21. But not all of the entries are based on grief or sadness, some are quite humorous too. Regarding your phone bill, it is overdue. There seem to be a lot of collect calls to, to Errol Flynn. He can't help you with the girls, he hasn't made a film in years. In the dark, there's enough space to forget. In the dark, forgetting is never enough. By far my favourite is titled The Bear. It's speaks of a simple child's toy who isn't living, but can be breathed life into. It's just lovely. David Stavanger is an incredible artist, as poetry is something far more than being an author, it's a mastery of words that are used to instill light in others, to share feelings and give the reader a sense of reflection and power to interpret the work to comfort, ignite and empower. A beautiful read. I actually haven't read a lot of poetry in general but haven't read any for a while... this really does sound intense though. It sounds so personal and.. poetry has a way of moving you. I can imagine that some of the issues this book deals with will be serious. I am really glad you enjoyed this, Kelly. It sounds like a lovely read and the lines you picked are gorgeous! Since reading a few verse novels, I've been looking for more and this one was an incredible mash up of milestones that I think nearly everyone can relate to. Ranging from sweet, to adorable and gritty and heartbreaking, it really does have something for everyone.